We have a two-dog limit in our neighborhood. Which is probably a good thing, because I live with someone who was not allowed to have a dog when he was a child. Mothers out there I am pleading with you to get your little boy a desperately wanted dog, even if it sheds in the kitchen. A little hand vacuum will save them wanting to adopt every dog they see when they are adults. 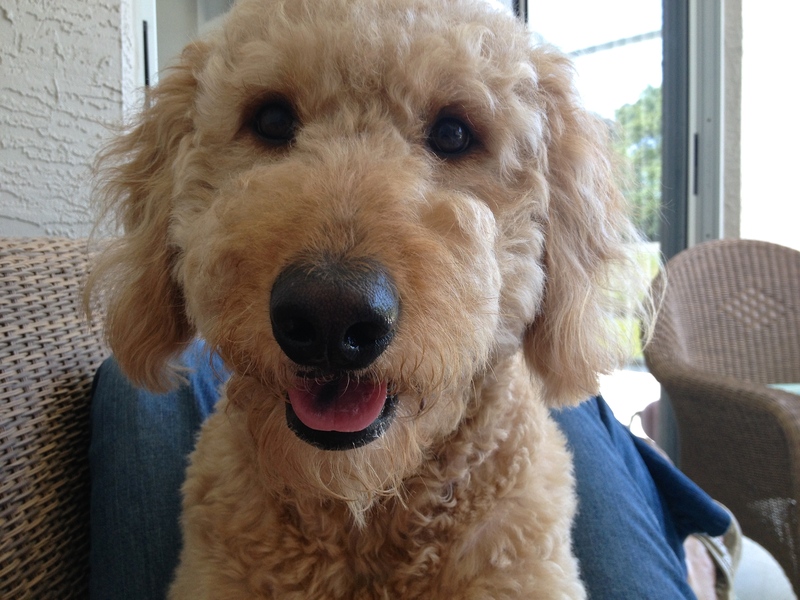 This is Sylvia, the Golden Doodle, named after a play by I love by A. R. Gurney. If you have ever loved a dog, you must read it, or even better, see it performed. In case she was feeling left out, I have composed another brilliant haiku for her. I am on a roll. This entry was posted in Uncategorized and tagged #adopt, #ARGurney, #blogging, #brilliant, #community, #dog, #family, #GoldenDoodle, #haiku, #humor, #NationalPoetryMonth, #play, #poem, #Sylvia, #writing by thebufferzoneday. Bookmark the permalink.